I was exhausted at the end of Badalona, so I had my doubts as to whether I’d actually play in the rapid tournament in Poble Nou. Even after the three days in-between, I was still a bit tired, but I decided that a rapid tournament wouldn’t take too much more out of me. As added motivation, I needed at least one rapid tournament to qualify for the overall Catalan Circuit prizes (combined total from 5 events). Like the previous category-A tournaments on the Circuit, this one featured Lazaro Bruzon at the top of the list and a host of Cuban IMs and GMs behind him. It was a 10-round swiss at a time control of G/25 (no increment or delay). There were 7 GMs and 14 IMs playing, as well as a dozen WGMs, FMs, etc. Even though I was playing way down, the first round was actually a bit of an adventure. The tournament started at 10 AM, and while I had woken up in time, my brain was lagging a bit behind. I thus decided to try and completely avoid his attack by entering an endgame, but the endgame promised me few objective chances as it was tough to find any active idea. However, he finally made a mistake and I ended up winning. Round 2 was a much smoother affair, as I outplayed my opponent from start to finish. With a G/25 time control, there is the opportunity to think a few times during the game. This was one of those moments for me. 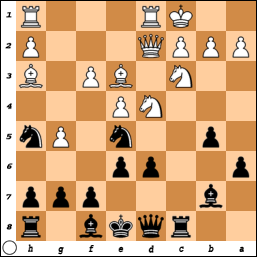 The thing is that I need to move my knight on d2, but moving it to b3 (to prepare Bf4/g5 and 0-0-0) allows Ng4xh2, when Black has a nasty check on f3 after the Rf1 moves. I’m playing my final tournament of this summer trip in Sants (Barcelona, Spain) right now. We’re through 8 rounds, and I have 6/8 with 2 more games to go. GM Maxim Rodshtein and IM-elect Orelvis Perez Mitjans are in the lead with 7/8. I’ll recap the Poble Nou rapid tournament and Sants once I’m done playing. In the meantime, Canadian GM Mark Bluvshtein (also playing at Sants) has a chess blog at http://markbluvshtein.wordpress.com/ where he posts his game and analysis every day. GM Jon Ludvig Hammer also has a relatively new site and blog at http://gmhammer.wordpress.com/. Finally, the US Chess League has started back up this week. The SF Mechanics got off to a nice start with a 3.5-0.5 win in the first week against the Dallas Destiny. I played the first five seasons of the USCL, but I’m taking a break this year. In my last blog, I mentioned how even if I beat Konguvel, I would need some help to make the final 8. In a strange turn of events, almost all the results around me worked in my favor, but almost all my previous opponents lost. Thanks to those results around me, there were 5 people with 5/6. That left 3 spots for the 7 players (including me) who were tied with 4.5/6. Unfortunately, my collective opponents from the first 6 rounds scored a whopping 1.0 out of 6 that day. Most of my fellow 4.5’ers had played weaker fields up to that point, so even with that 1.0/6, not enough of them leapfrogged me in the Buchholz race. I thus snuck into the final 8 as the #8 seed, but had any of my previous opponents won that day, I would have moved up to #6. I also wrote earlier that the two-stage design was somewhat similar to the 2010 US Championship. The knockout stage in Badalona, though, was rather different from the second stage of the US Championships. In St. Louis, they had the top 4 break off and play a round-robin. Here, in the first round of the knockout, seeds at opposite ends of the bracket faced off in the first round. Each round would start with a single slow game with rapid tiebreaks if necessary (and potentially blitz and Armageddon as well). With only one game and no draw odds, the only advantage you can give the higher seed is the white pieces, and that meant that as the #8 seed, I would get the black pieces in all 3 rounds no matter who I played. I would only see the white pieces if I drew the first game. In round 5, I was black against GM Lazaro Bruzon. Bruzon was listed at 2653, but having played through the Catalan Circuit (and Pamplona) with nothing but success, he was up to about 2675 at game time. I had played him once before, in 2008, and while I got into serious trouble there, I managed to escape with a draw. This time, I was not in any trouble until I managed to lose! He surprised me by playing an Anti-Marshall with 8.a4 (in the Ruy Lopez), even though I wasn’t “threatening” to play the Marshall. With the pawn already on d6, it’s not supposed to be very dangerous because Black doesn’t have to play …Rb8 (giving up the a-file), …b4 (weakening the b-pawn and the c4-square), or …Bb7 (putting the bishop on a diagonal where it just hits against the strong e4-pawn). Following Balaguer, I continued my play in the Catalan Circuit with Badalona. The Badalona tournament is a pretty unique one on the calendar, although I guess it shares some similarities with this year’s US Championship. In the top section at Badalona, everybody plays in a 6-round swiss to start the event. The top 8 (using tiebreaks) then advance to play a 3-round, 8-player pseudo-knockout. Those not lucky enough to make it top the final 8 continue playing 3 more rounds of a swiss. Thus, everybody gets 9 regular games, but amongst the top players, it’s a real race to make that final 8. My tournament started off well as I beat Francisco Rojano (2127 FIDE) in the first round pretty handily. He played a Semi-Slav against me, and at the board, I decided to switch things up from my normal repertoire and played the 5.g3 gambit line instead of my normal 5.e3 (that is, 1.d4 e6 2.c4 Nf6 3.Nf3 d5 4.Nc3 c6 5.g3). 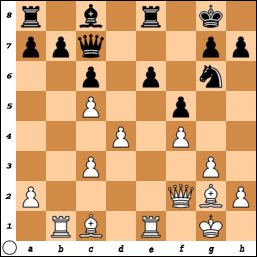 It’s always had its adherents, but in general, most top players don’t believe that the gambit offers White anything special with the knight on c3. 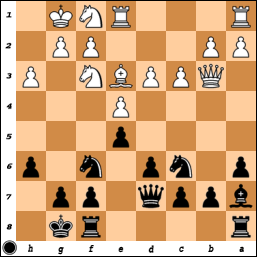 In the Catalan, a similar position can easily arise, but White’s knight isn’t on c3 so early there. That early development puts it in the line of fire with …b5-b4 (in response to a typical a4, for example), or …Bb4 and …c5 ideas. My opponent didn’t know the theory of the line, though, and let me develop very smoothly. In the diagram below, he just played 19….Qc7. White is clearly better, but to make progress, he needs to open the position to take advantage of this greater potential. With that in mind, I played 21.c4 here. I want to play d5 next, opening the long diagonal for the Bg2 and also clearing a diagonal for my dark-squared bishop. After 21…b6, I continued forward with 22.d5. There isn’t really anything for Black to do now; his position is pretty much lost. 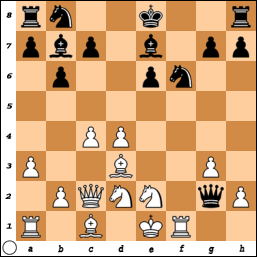 For example, 22…cxd5 23.cxd5 Qxc5 loses to 24.Qxc5 bxc5 25.dxe6 (or 25.d6), when the Ra8 is trapped. He tried 22…cxd5 23.cxd5 Bb7, but that offered no respite after 24.c6 Ba6 25.Ba3. I wrapped up the game on the 30th move. I finished my last blog on a positive note, with a win where I finally played well from start to finish. As it was, I did manage to continue to play well through the rest of the tournament, but I wasn’t able to parlay that into any wins. Instead, all three of my games ended in draws (and thus, the title is inspired by Picasso’s so-called “Blue Period”). His last move was a new one for me, and so I sat down to think about my move. I can’t avoid the bishop exchange, but should it take place on e3 or a7? I played 13…Rfe8, and both of us agreed after the game that this was the right move. 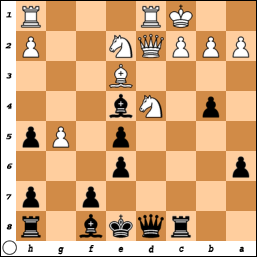 One problem with exchanging on e3 right away is that after 13…Bxe3 14.Nxe3, Black cannot easily chase the queen away from b3 because the b7-pawn will still be hanging (for now, …Rfb8 would trap the queen if it took the pawn). Black also has to think about a Ne3-d5 jump, as after an exchange on d5, White might quickly play d4 and gain a small advantage in space and activity. I’ve had some WiFi issues in my apartment in Barcelona, and so I haven’t been able to put together a full post wrapping up Balaguer. I’ll try and get it done in the next few days. In the meantime, a little interlude that chronologically also happened to come after my 6th round game. In my last tournament at Balaguer, after my post-mortem with Swaminathan, I walked over to where GM Stewart Haslinger and IM Bernd Kohlweyer were discussing their game. It was a Sicilian Najdorf, and after their analysis, Bernd wanted to show an amazing game that doesn’t appear to be publicly known (I wasn’t able to find it any of my databases, or even a reference to it online). It was between GM Namig Guliyev and IM Thomas Henrichs in 2006. Maybe some writer, seeing the game on this blog, will include part of the combination in a future book! 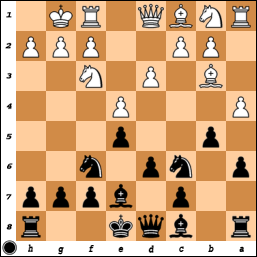 The game began 1.e4 c5 2.Nf3 d6 3.d4 cxd4 4.Nxd4 Nf6 5.Nc3 a6 6.Be3 e6 7.f3 b5 8.Qd2 Nbd7 (this was the same line Kohlweyer played against Haslinger) 9.g4 Bb7 10.g5 Nh5 11.0-0-0 Rc8 12.Bh3 Ne5. I know nothing about the opening, so I won’t really comment on these moves.